When we remember the games of the past, we tend to look back with rose-tinted glasses. We remember how a game made us feel at that moment in time, all with a slightly skewed sentimentality. But without mentioning names, anytime I’ve gone back and played titles from years gone by, I’ve rarely found the same enjoyment, with the magic having gone missing. It’s not because the game has got worse, but because the passage of time has moved on and new gaming experiences are at the fore. So, with Lumines Remastered having arrived, is it a time to look back in anger, or is it a case of a gaming renaissance’s regeneration? 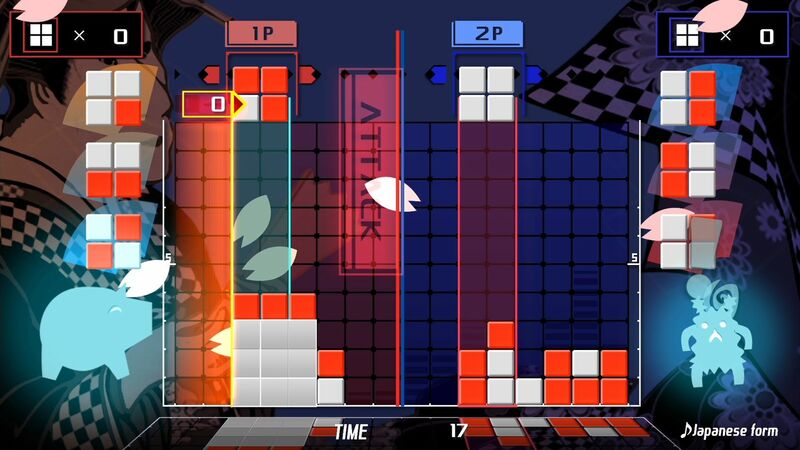 First released back in the hazy, lazy days of 2004, Lumines was made for the PSP, hoping to be what Tetris was for the Gameboy. It was critically received and the vast majority of those who played it loved the playability, sounds, and addictive gameplay. Now we have it on console, upgraded graphically and with some new modes added in for extra fun. But it’s the simple gameplay where the heart and fun of this game is. 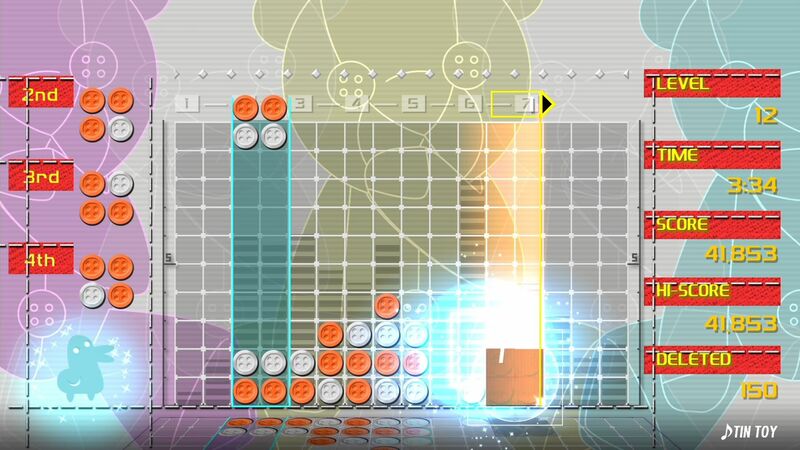 Similar to the Tetris setup and obviously inspired by the great game, Lumines Remastered is simple to learn, but almost impossible to put down. Square blocks fall down from the sky in two different colours, and it’s up to you to turn the block and place them together with others to form larger swathes of colour. It all combines with a pumping soundtrack as the board gets swept and points tallied up, with linked blocks cleared in time to the rhythm of the beat. If you allow the blocks to build up, without getting linked and cleared, then the playing area will eventually get full, the ceiling will be hit and it’s game over. Lumines Remastered is actually a bit of a surprise. I initially took in the tutorial in a bit of a ‘meh’ way, but then the moment you start to play a magical thing happens… and you can’t stop playing. It’s very addictive and as you come to the end of a run, you can’t wait to start all over again. And playing again sees progression, which in turn sees the music and tempo change, as the gameplay gets faster and more intense. But when you’re in the zone, nothing will stop you from playing on because this is one of the most addictive puzzle games you can find for your money. You play most of Lumines Remastered in Challenge mode, which is most definitely one for the endurance gamers. Skins (music) are earnt as you progress and this is really the main mode you will play the most. There is also have a very compelling Puzzle mode that asks you to make different shapes and a versus option which pits you against the AI or another local player. Playing against the AI is very tricky – especially if your reflexes are as good as mine – but I do feel Lumines is missing a trick by not having an online vs mode because this is one game that fully deserves one. But if you like the Challenge mode, that is all you really need to play – just watch the clock though as hours can rush by in a heartbeat. Lumines Remastered has been polished up and injected with a bit of HD, which for a game like this is always hard to tell the difference. Everything here though is very pretty, with great colouring and shading. The menus and presentation throughout are top notch with some great little effects and nice backgrounds to be viewed while playing. But apart from the addictive gameplay, Lumines is all about the soundtrack as it’s such an integral part of the heart and soul. All the original line up of tracks are here to listen and play to, and some of you might think these would have dated with time. Far from it though and the track selection is excellent, working brilliantly with the action on screen. 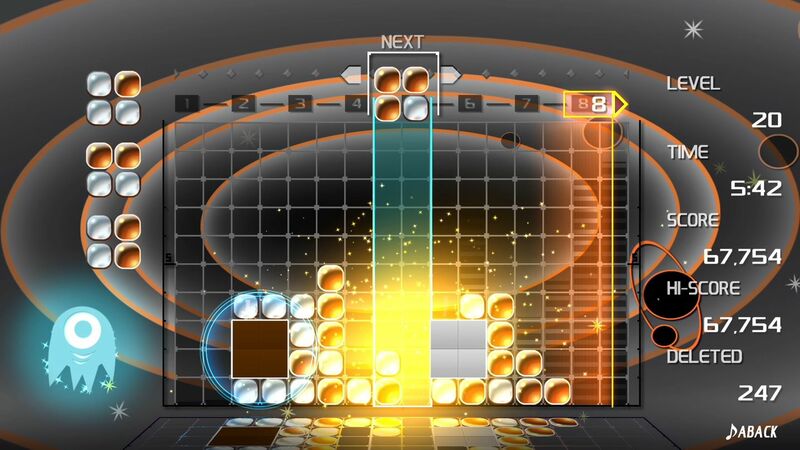 Lumines Remastered is a wonderfully addictive puzzle game. It’s perfect for the mobile market, but it’s nice to have a game like this on console, if only for a bit of variety in the digital library. The gameplay, soundtrack, and presentation are all top notch, but it is missing an online mode and I think the price could be a tad cheaper. If you love games of this type though then this is a must buy for you. The past has come back, and it’s not in the haunting mood.